(Novel - 132k words. Love Story, Coming-of-Age, Historical - Paperback or eBook) In 1960 when Clair Wagner's friends are showing off their new bikinis at the local swimming hole and planning weddings, Clair is plotting her escape from her rural farm-community life. She is headed for college on the shores of Lake Erie with plans for the future and dreams of a "handsome sailor with the constellations of the Northern Seas in his eyes". Into her life comes Pio, a beautiful Italian fisherman, who longs for a life of adventure on the Great Lakes under the aurora borealis. Clair soon meets Gary, the dashing son of a wealthy shipping magnate, who introduces her to Canal Street on the waterfront where she encounters The Old Mermaid Inn, a tavern that, as Gary tells her, "deserves its reputation". But The Old Mermaid Inn, with its giant painting of a seductive mermaid, is home to some fascinating people including Tessie, the owner and original mermaid, and the intriguing Baptiste, a Breton mariner injured in a shipwreck, who earns his living as a musician. With Pio, Clair discovers passion, with Gary she gains entry into the world of the commercial waterfront, and with Baptiste she discovers all-consuming love. But as her relationship with Baptiste grows she discovers he is far more complex and mysterious than she could imagine. He has secrets and his secrets will alter her life forever. 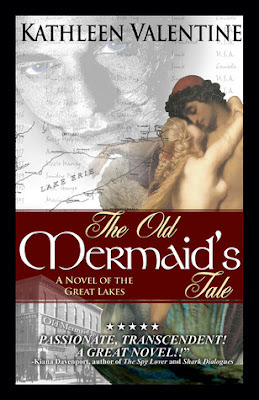 You can learn more about "The Old Mermaid's Tale" by going HERE. where she writes, Kathleen Valentine loves nothing more than listening to the stories that people tell while sitting on front porches, gathered around kitchen tables, or swapped in coffee shops and taverns. Her collection of legends, folklore, and tall tales are woven into her fiction. 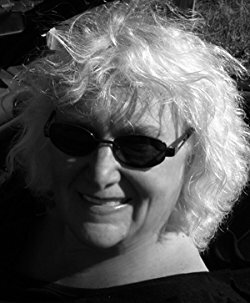 The award-winning author of novels, novellas, & short story collections, as well as books of knitting patterns, & a cookbook/memoir about growing up Pennsylvania Dutch, Valentine has been listed as an Amazon Top Selling Author in Horror, Mystery/Suspense, Cooking, and Knitting. As a writer her primary interest is delving into the psychology of her characters. Her stories are sometimes mysterious, sometimes funny, usually romantic, and frequently frightening. Her characters range from lost children and grumpy old folks, to mysterious men and women who are not to be trifled with. She lives in Gloucester, Massachusetts, America's oldest seaport.